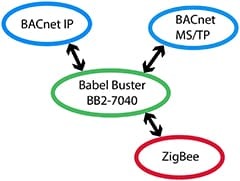 The Babel Buster BB2-7040 BACnet to ZigBee® gateway connects Maxstream ZigBee devices to a BACnet network. 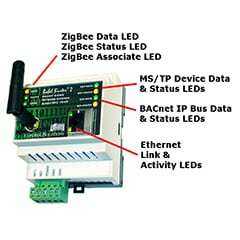 The BB2-7040 is a BACnet client/server device that functions as a ZigBee Coordinator and gateway. After setting up the appropriate mappings in the BB2-7040, data from ZigBee sensors (MaxStream profile) will appear as BACnet objects on BACnet IP and/or BACnet MS/TP. 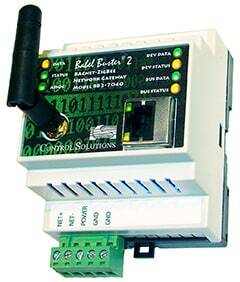 Data written to BACnet objects can also be propagated to ZigBee actuators by the BB2-7040. 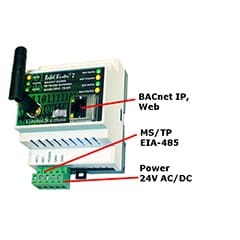 The BB2-7040 supports both BACnet IP and BACnet MS/TP. BBMD and COV support are included. Up to 400 objects may be mapped to up to 100 ZigBee devices. The BB2-7040 operates primarily in Listen mode, simply waiting for ZigBee devices to report in. When the ZigBee devices do report in, the BB2-7040 searches its known device list and data maps to see if the reported data should be saved as a local BACnet object's Present Value. 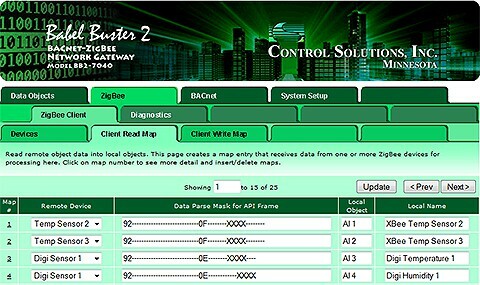 Control Solutions’ Babel Buster® BB2-7040 is a BACnet client/server device that functions as a ZigBee Coordinator and gateway. After setting up the appropriate mappings in the BB2-7040, data from ZigBee sensors will appear as BACnet objects on BACnet IP and/or BACnet MS/TP. Data written to BACnet objects can also be propagated to ZigBee actuators by the BB2-7040. The BB2-7040 expects most ZigBee endpoints to be low power devices that spend most of their time sleeping. Therefore the traditional gateway behavior of polling slave devices will not work. The BB2-7040 operates primarily in Listen mode, simply waiting for ZigBee devices to report in. When the ZigBee devices do report in, the BB2-7040 searches its known device list and data maps to see if the reported data should be saved as a local BACnet object's Present Value. The collection of BACnet objects found in the BB2-7040 will maintain the most recently received ZigBee data as their Present Value. Other BACnet clients may then query the BB2-7040 server to obtain that most recent data using a simple Read Property request. BACnet clients may use a Write Property request to any of the BB2-7040's output objects to send data to a ZigBee device when mapped for writing. The BB2-7040 will transmit to the ZigBee device, and a properly configured ZigBee device will receive the transmission at the end of its sleep period. The BB2-7040 may also function as a BACnet client, and will use Read and Write Property requests to share data with other BACnet servers (slaves). The BB2-7040 therefore has the ability to transfer data between ZigBee devices and other BACnet devices that operate as a slave only. The BB2-7040 includes its own internal web server that provides a web based user interface for configuring the BB2-7040. Configuration is done using simple templates, and each web page has an online help section at the bottom. 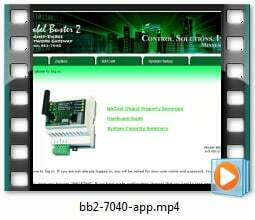 Click the link below to view a demo copy of the entire Web UI in the BB2-7040.